This little house on the prairie is constructed of sod walls and a dirt roof. It is one of the few pioneer dwellings still standing in the Badlands today. A homestead at last! Many eastern families who longed for the opportunity to own and farm a plot of land of their own were able to realize their dreams when Congress passed the Homestead Act in 1862. That landmark piece of legislation provided 160 acres free to any family who lived on the land for five years and made improvements. The same amount could be obtained instantly for the paltry sum of $1.25 per acre. Combined with the completed transcontinental railroad, it was now possible for an easterner yearning for the open space of the West to make it happen. Unfortunately, the lives they found were fraught with hardship. There were tremendous economic difficulties associated with Western farm life. First and foremost was overproduction. Because the amount of land under cultivation increased dramatically and new farming techniques produced greater and greater yields, the food market became so flooded with goods that prices fell sharply. While this might be great for the consumer, the farmer had to grow a tremendous amount of food to recoup enough profits to survive the winter. 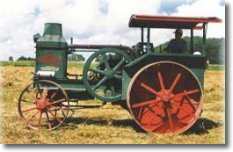 This 1924 Hart Parr model 20-C, is the only running tractor of its kind known to exist. New machinery and fertilizer was needed to farm on a large scale. Often farmers borrowed money to purchase this equipment, leaving themselves hopelessly in debt when the harvest came. The high tariff forced them to pay higher prices for household goods for their families, while the goods they themselves sold were unprotected. The railroads also fleeced the small farmer. Farmers were often charged higher rates to ship their goods a short distance than a manufacturer would pay to transport wares a great distance. The woes faced by farmers transcended economics. Nature was unkind in many parts of the Great Plains. Blistering summers and cruel winters were commonplace. Frequent drought spells made farming even more difficult. Insect blights raged through some regions, eating further into the farmers' profits. Farmers lacked political power. Washington was a long way from the Great Plains, and politicians seemed to turn deaf ears to the farmers' cries. Social problems were also prevalent. With each neighbor on 160-acre plots of land, communication was difficult and loneliness was widespread. Farm life proved monotonous compared with the bustling cities of the East. Although rural families were now able to purchase mail-order products through catalogs such as Sears and Roebuck's and Montgomery Ward, there was simply no comparison with what the Eastern market could provide. These conditions could not last. Out of this social and economic unrest, farmers began to organize and make demands that would rock the Eastern establishment. This illustrated page briefly explains the changes that took place in life on a typical Iowa far between 1850 and 1900. From "Living History Farms" of Urbandale, Iowa. The Homestead Act opened up opportunities for middleclass and poor women to own property. Adeline Hornbek homesteaded in Colorado and became a very successful rancher/farmer. Her story is told here with images, maps, and brief essays on the Victorian age and on homesteading. 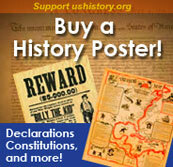 From the National Park Service's "Teaching with Historic Places" lesson plans for teachers. 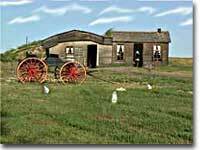 This website is from the National Park Service's national monument to homesteading at Beatrice, Nebraska. You 'll find info and images concerning education, log cabin life and the tall grass prairies. Focusing mostly on eastern North Dakota, two collections of historic photos from the Library of Congress document the settlement of the Great Plains. See early sod homes, agricultural implements, farming scenes, small town life, social events, and even a look at education on the prairie. Articles on several topics guide you to the pictures. Orphaned and homeless children in New York and a shortage of labor in the West. Placing the children for adoption in Kansas seemed like a win-win solution. Read here about the oprhan train placements, with a history, timeline, stories of some of the children, and newspaper accounts. Historic photographs, too. Daniel Freeman was the first homesteader under the Homestead Act of 1862. Here is his story, with links to photographs of him and his homestead in Nebraska. In the mid-1800s approximately 30,000 homeless children lived on the streets of New York, and over the next 75 years between 150,000 and 200,000 "orphan" children were sent to new homes in the West via the Orphan Trains. Farming was the major occupation of Americans until the U.S. Census of 1870 showed that it had fallen to only 47.7%. Sod houses were warm in the winter and cool in the summer, great for humans and all sorts of animal life, too!